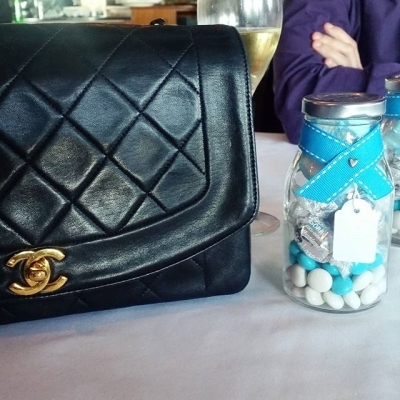 I am SO in love with your handbag, a vintage Chanel bag is forever on my wish list!! That vintage Chanel bag is is everythingggggg! So gorgeous! It's great that you found a new location. Love both your outfits, the Chanel bag is gorgeous! Hah, I'm the same way. My two (or 3) usual spots unless I go out with Lydia and she takes my pictures. Or if I'm on vacation. Love the prints of both these dresses! LOVE that last floral maxi!!!!!! Also, I have Chanel envy. I really like your outfits.!! Such pretty scenery in the first pic, and I hope you enjoyed the wedding! Love both of those dresses too--such pretty prints! It was a lovely wedding! Small and intimate and such a beautiful view. love that gigi maxi dress! the neckline is so cute! fun post! Both such pretty dresses on you! I always take my photos in our yard because I don't have a chance to go anywhere else. I am always impressed with people who have many different backgrounds for their outfit photos! Yes it's much easier using the same spot each day - I'd struggle being organised enough to look out different spots, haha! You look absolutely gorgeous in both these maxi dresses, girlie, as well as the Chanel bag, which looks great paired with both! Your hair also looks amazing, did you do anything different? Thanks so much for sharing, beauty, and I hope you're having a great start to your week so far! Oh how gorgeous you look in these looks! The location for the first outfit is indeed pintoresque! I understand it can be quite time consumming finding new locations for each shot, i can't imagine how it must be with children! Haha I try to get a pretty backdrop for "outfit photos" (which never end up on the blog) but sometimes it's really hard! And then I'm usually with my friends so they all end up being goofy pics that don't show off the outfit at all lol. Love that printed maxi in the second pic, you look great in it! You look amazing in both dresses, Mica! I love the colour of the first one on you, and the top/neckline of the 2nd one is fantastic. Glad you are getting out for some "me" time, but must be hard to leave the little ones at home! That is a great great bag! What a classic! Beautiful dresses! You look great! I'm glad you got to enjoy some adults-only time (but I know that it's hard, too!). It is both good and hard at the same time! Haha I love the new background, and was actually the first thing I noticed! Loving that dress so much too! You look fabulous! I love both of your maxi dresses and they also both look great with your vintage Chanel, but Chanel looks great with everything! Oh, I know finding the right location sometimes can be so challenging and therefore I think what you do now is very clever! I love both of your maxi dresses including your vintage Chanel - you look absolutely beautiful in them! You look gorgeous in both of these dresses! Background of the first photo is beautiful, it is really nice view. I didn't notice the necklace until you pointed it out, it actually looks pretty. I hope you had great time at the wedding and also at night out! I don't think I have seen either of these gorgeous maxi dresses but I love them both, especially the second one. Purple and lavender suit you so much. Like you I have blogged over 4 years and usually alternate between 2-3 places in or around the homes I have lived in, for convenience. BTW, I had never heard the word 'express' when it comes to nursing a baby. Interesting! Hope all is well, Mica. I think you call it pumping in America? It's funny how the words are so different, like nursing instead of breastfeeding too! Here nursing a baby means cuddling a baby, ha! Loving both of these dresses on you, and that might be my all time favorite bag of yours. 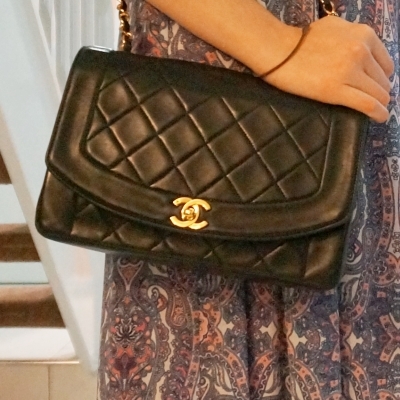 If I were to buy and high end designer bag, a classic Chanel would be it. Fun seeing your backdrop change. Hope you enjoyed the wedding. I love both maxi dresses on you, Mica! You're not the only one who gets into a routine and stick with the same backdrop, I am the same. I've noticed that recently and been trying to change my photography up a little. Hopefully it'll look better in the upcoming posts. That bag is such a stunner, lady- great vintage find! Both dresses are gorgeous and style so well with that stunning Chanel bag! I imagine it's got to be tough when you need to make sure your outfit works with having to breast feed, especially when it comes to dresses. The maxi for the wedding was a nice choice, and I really love your evening out dress, even if it will be a while before you can wear it again, at least it got out once. Yes I knew I wanted to wear it as who knows how long it will be until it gets worn again! Dresses can be tricky to feed in for sure. That second dress has such a great print! sooooooo I've read a bunch of your posts now and have officially decided that I'd like to have your bag collection... seriously, you've got some killer purses and I'm totally coveting them!! Hope you had a nice time on both occasions! I'm going to try and remember to start bringing my mini tripod with me into work so I can sneak some city scapes into my everyday style pics! That would be awesome! :) I often think of that when I'm at work but it's hard finding a spot or someone to be photographer! Maxi dresses are looks great on you! Pretty! Both dresses are beautiful and I love the scenery on the first picture. It's so difficult to find a good background to take pictures but nature and green fields is always a good idea! Both Maxis look gorgeous on you. I especially love the colouring of the first one. I have a tripod and remote so that makes it easier! :) But it can be tricky trying to get the toddler to get out of the frame, haha! Very nice maxi dresses. I love the second one. Such a nice pattern. You look so amazing in maxi dresses! Mica, I love those two dresses! The prints are so pretty on you! I would probably be in the same spot all the time also. LOL You know, your location never phases me because I'm always focused on the outfits. But I bet it was refreshing taking pictures in a different spot. Again, love both outfits. They look awesome. Well you know, I take my pictures always in the same spot and usually at the same time every day. It's easier, specially because I take them myself. I think you looked good in both dresses and see nothing wrong with the necklace on the first outfit. Of course you are aware that the bag elevates both looks. Yep, sounds like I'm exactly the same as you - same time, same place each day as it's easiest! These maxi dresses are both so pretty! And they look great on you! Sometimes it's fun to change it up a little. I keep telling myself "one day" I'll do outfit posts again. I used to put so much pressure on where I would pose, and you're right, that's so silly! Absolutely loving these printed maxi dresses on you! 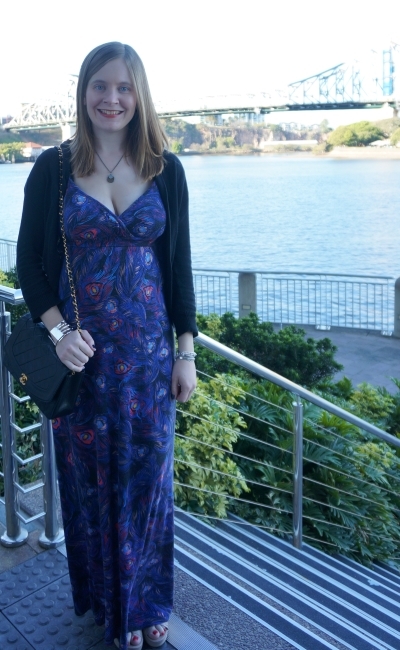 I can't wait for the warmer weather to come soon so that I can start wearing my maxi dresses again.